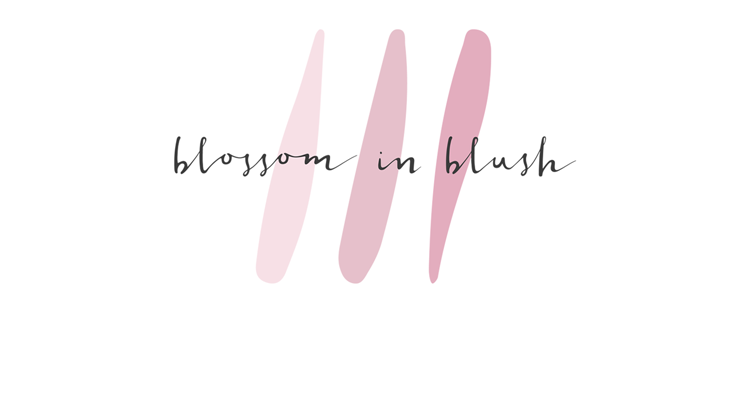 Boscia Makeup-Breakup Cool Cleansing Oil - I've talked about this before in a Champagne or Beer? post, and to this day this product is still my everything. Could not live without it. It just gets EVERYTHING off, and leaves you feeling fresh and clean. 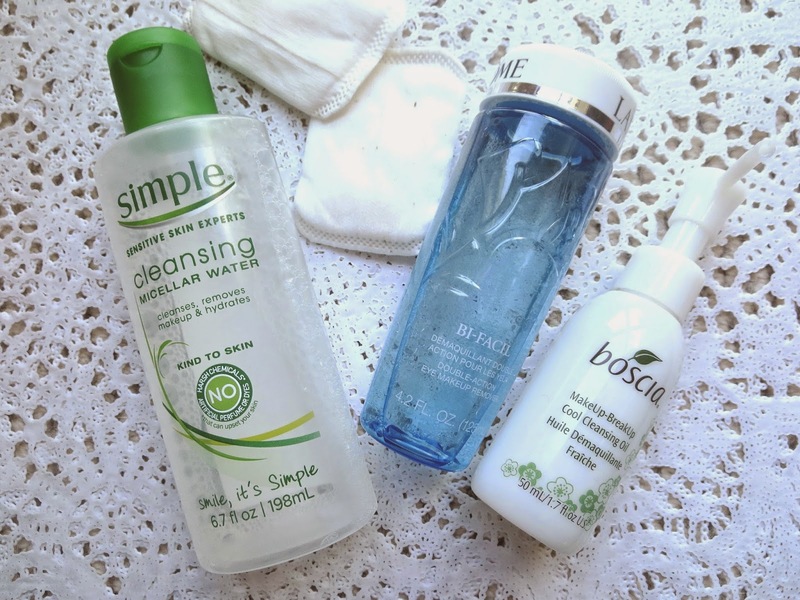 Simple Cleansing Micellar Water - Again, spoken of in a Champagne or Beer? post...Like super recently, so you can read more about it there. It's as great as the Bioderma, leaves you feeling more "moisturized" if that makes sense though. Not great at removing eye makeup as much, or every last trace of face makeup if you're wearing a lot of it. But good for lighter days, and quick cleanses/freshen up. ALSO forgot to mention before, but for those mornings when you're in a rush or if you have very sensitive or dry skin, this a great thing to use in morning to cleanse! Lancôme BI-FACIL Double Action Eye Makeup Remover - This has been my favorite eye makeup remover for ages! I don't know if it's just cause my mom always had a little bottle laying around (from those gifts with purchase at department stores), but I've always reached for this one. Regardless of the reason, what matters is that it's effective and gentle (most removers sting my eyes) and doesn't leave an overly greasy feel on the eyes. 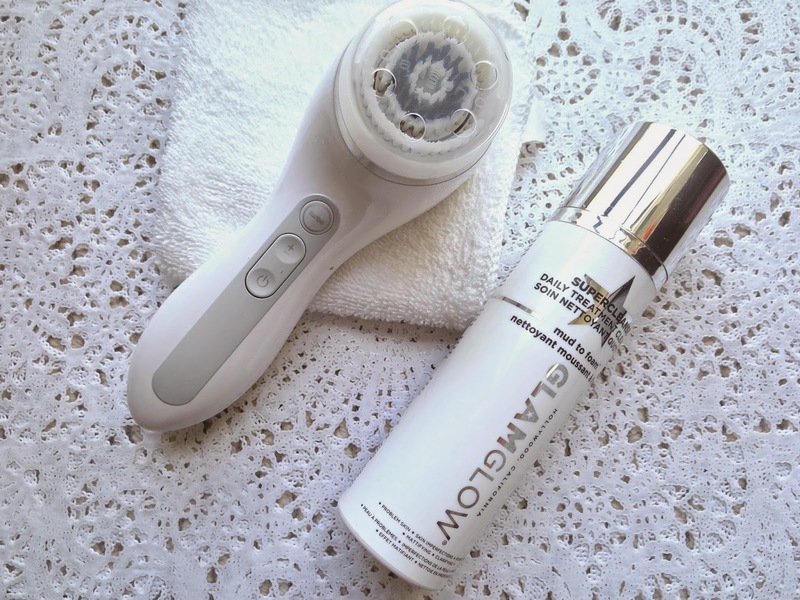 Once your face is "bare" you can go ahead with a cleanser, to really deep cleanse. GLAMGLOW SUPERCLEANSE Daily Clearing Cleanser - As mentioned in my January Favorites, I am still very much in love with this cleanser. Keeps me bright and clear! Gentle, purifying and not overly drying. Will most likely repurchase when I run out. Clarisonic Smart Profile Face and Body - I recently got this as a gift, and sorta tossed my Mia 2 to the curb (there's nothing wrong with it and it's still a good investment) as I was having an easier time with this one. It essentially cleanses the same, but has different speeds, timers to tell you when to move and a "turbo" mode to cleanse even deeper? Who knows. I don't know if it's the brush, but I find myself being able to use it more regularly. This is better for use with gel type cleanser but I can still make it work with my GlamGlow cleanser, it's just a bit messier. Sometimes I'll use with with my Soap & Glory cleanser and that works like a dream! Dream team. The next step is scrubs and toners! I use a scrub 2-3 times a week, usually before I do a face mask. If I'm going to use an exfoliator, I won't use my Clarisonic, to make sure I don't over do it. I'm also pretty in tune with what my skin needs, so I have a VERY gentle option and a gentle option. 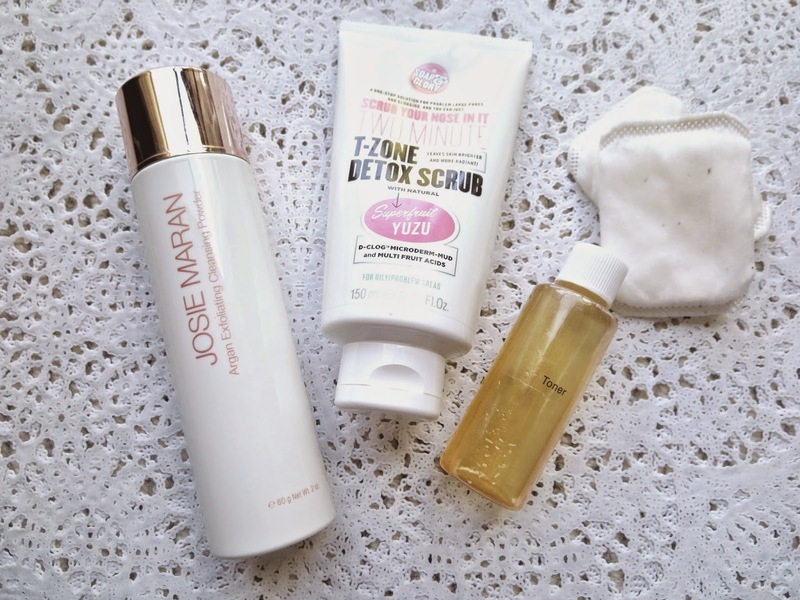 Josie Maran Argan Exfoliating Cleansing Powder - This is just when I want to exfoliate ever so gently when my skin is feeling a bit more sensitive and dry. It doesn't have any harsh scrubby parts, it's just nice and creamy and hydrating. It's packed with great ingredients to really kick your skin back into shape. I also find it to be brightening, but not as effective to help "retexturizing" the skin. Soap&Glory Scrub Your Nose In It Two Minute T-Zone Detox Scrub - Of course I would only find this on clearance when Sephora was liquidating the brand (as mentioned it is no longer sold at Sephora stores). But I love this! Now if you're sensitive to smells, this might be too much for you. It has a very strong minty and clean scent but kind of unnatural, almost like household cleaning products...I however, don't really care. Now this says "2 minute" scrub, I honestly can't scrub for that long especially at the end of the day, sorry can't be bothered. That being said, I do it for 30sec to a minute like I would any other product and still find it effective. You can also let it sit on your face a little bit and then rinse it off. This doesn't have a harsh grainy texture either, but I can feel it a bit more than the Josie Maran. Just like my trusty cleanser it has Yuzu super fruit and exfoliates your skin with multi fruit acids (AHA) as opposed to scrubby particles that can be irritating! I haven't been using this for as long, but the results are already impressive. Also it makes your face tingly (like someone who just used mouthwash blowing in your eyes lol) for a while, not sensitive or irritated, just like a lasting "cooling" sensation. Magic Potion Toner - Not much more to say here, I still use my trusty ACV DIY Toner (recipe here), and every time I stray away, I feel my skin just starts breaking out more, and just overall, is not looking as good. I'm not saying I'll never use another toner, but so far haven't found anything as good or better... I only use it at night, because it's not drying per say but it's not hydrating either, plus it smells, so you know? And last but not least, you want to finish with your oils, serums, moisturizers and treatments. Honestly though, I have a hard time finding night creams that don't make me break out. Everything is just too heavy it seems, so I do skip it sometimes, but am continuously searching for one that works. In my defense, I always use an oil/serum, so it's not SO bad. Right? Kiehl's Midnight Recovery Concentrate - Sweet baby Jesus! How have I not spoken about this sooner? It should have been in my monthly favorites for a while now. This will give you baby smooth, brighter looking skin by morning. It's probably secretly made from unicorn sweat or something cause it's nothing short of magic. And I honestly feel like it's enough "moisture" for me, but it's probably not...Regardless, LOVE IT. Run to Kiehl's, get a sample, try it, run back the next and buy it. Just do it. I accept thank yous in the form of Kiehl's gift cards. 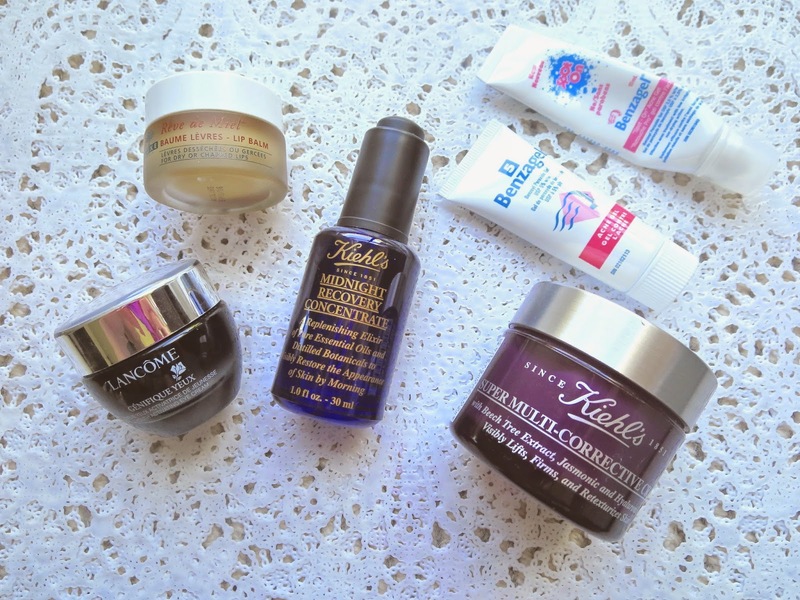 Kiehl's Super Multi-Corrective Cream - Just recently started using this, so I can't vouch for how I like it, just thought I would mention it, as this is what I'm currently testing out! Lancôme Genefique Eye Youth Activating Eye Concentrate - I use again this eye cream at night. Nuxe Rêve de Miel Lip Balm - As expected, I slap on this bad boy before bed too! Benzagel 5/ Spot On - I just dab this on any zits I may have once my other products are all well absorbed. I'm really scared to run out as it's not available in the US, and not all benzoyl peroxide produtcs are made even, but I'll keep you posted! And that's it! THANK GOD! Wow, it doesn't seem like that many products when I'm doing it...This all takes very little time, I promise! Stay tuned for more skincare routines posts this week (sensitve/dry and troubled skin)!